Faaa... Aces with Dominique DuvivierWOW! What an eye-popping effect! 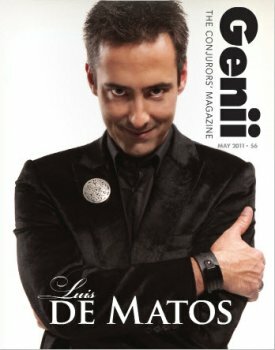 Get ready for an unbelievable demonstration of card magic that is within just about anyones ability. Faaa... Aces combines the maximum impact of multiple effects with minimum effort. You display four different queens. Instantly, they change into the four aces and the four queens are found on top of the deck. The queens are placed in an overlapping row and three aces are inserted between the queens. The fourth ace is placed on the deck. All seven cards are then squared together. Instantly, you are holding only four queens, which are dealt face up on the table. The aces have vanished! All four aces are now found on top of the deck. Comes complete with specially printed Bicycle cards from the U.S. 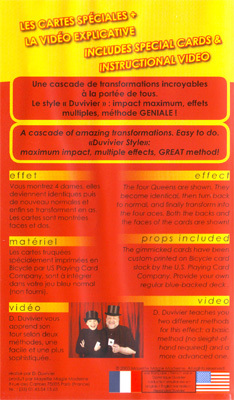 Playing Card Company, and an instructional video containing two versions starring Dominique Duviver performing and explaining everything you need to know. NOTE: There are absolutely no refunds on these clearance items. It is your responsibility to know whether or not you can play these VHS tapes based on their format (PAL vs NTSC). Simply enter your details below and we will send you an e-mail when “Faaa...Aces (VHS) by Dominique Duvivier” is available to ship!